There is a lot of talk about how the offensive line must be excellent blockers. I could not agree more! But, your wide receivers must be good blockers as well. The difference between a long run and touchdown could be whether or not your receivers did a good job blocking down field. We will have our split-ends work on receiver stalk blocking drills and techniques a ton turning the practice week. If they arrive early at practice our receiver coach will work on stalk blocking drills with them. We had a ton of success with our jet sweep this past season because we spent a ton of time working on stalk blocking. When we break into our individual practice sessions the linemen will go with their offensive line coach, the RBs will go with their RB coach, and the split-ends will go with their split-end coach. The split-ends will do conditioning drills that pertain to their position and they will practice receiver stalk blocking drills and techniques. We will have the split-ends go live one on one stalk blocking in practice. When the kids do not have pads on we will have them stalk block blocking shields. It is vital to practice stalk blocking every single practice. Come off the ball hard. We want to make the corner backpedal and think it is pass (vs. a soft aligned DB playing with cushion, also known as “playing off coverage”). As the Split-end closes the distance to the defensive back and gets about 2 yards from the CB the split-end then gets under control (do not over run, breaks down in front of the defender) and focuses on his aiming point. The SE’s aiming point is the midsection of the DB. Working into the defender-we tell our SE’s to play basketball with them, which means stay in front and mirror the defender. We want to deliver a jolting blow to the DB’s breast plate. Thumbs must be up and hands must be inside. Stay engaged with the defender by keeping feet moving. If we stop moving our feet the DB will defeat the block or the SE will get a holding penalty. Once the defender starts to evade the block, engage the defender and just take him anyway he wants to go. Block with attitude! Successful stalk blocking takes good athleticism and attitude. Remember, these cornerbacks/defensive backs will be good athletes so stalk blocking with proper technique is vital. Finish the block. Do not quite on the block, it takes a lot of effort. Practice makes perfect! Again, make sure you work wide receiver stalk blocking drills and techniques every single practice. 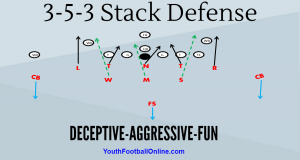 You cannot practice stalk blocking with your players twice a month and expect them to block these cornerbacks successfully. Stalk blocking is not only important for 11 on 11 football leagues, it is maybe even more so important for flag and 7 on 7 football leagues.